Most of us here on Chatlands know quite well what avatars or 'poses' are. Everyone has them. But sometimes you see that fancy-schmancy looking pose that you can't find in the Body Shop. Sooo you read on up Subs and such, and decide to buy a sub, and you find some cool freebie poses. Now you're thinking 'I'm gonna look so cool! ', the only problem is, how do you get them looking so wonderful? 1. Open your pose in your art program. 2. Open a new layer and name it something like 'Color', and make sure it's set as transparent. Hit 'Ok'. Make sure the new layer is above the pose layer. Click on 'Color' layer to make sure you've selected it. 3. Right above the list of layers, there should be a wide box that will drop down when you click it. Out of these options, click 'Multiply'. 4. Make sure you haven't made any other layer changes such as transparency or brush mode. 6. Remember to save as .png, and flip so you have poses that face both ways! So, now you got your wonderful fancy-shmancy pose. But now what? 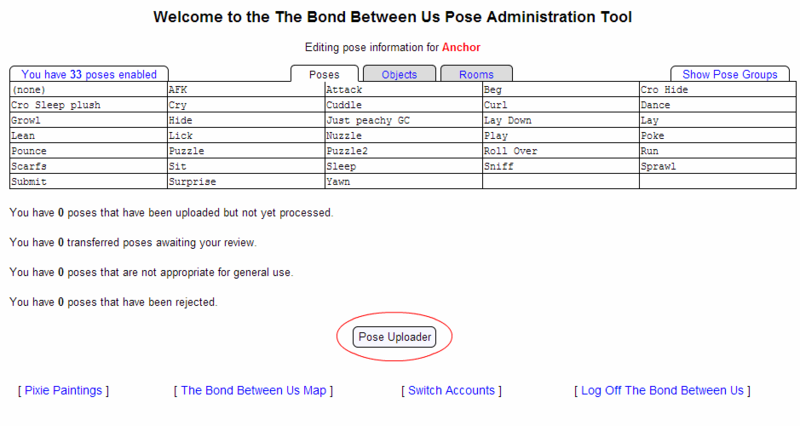 Check out Apodyopsis's How To Upload A Pose! topic. Step 1: You will need to find an object off of google first. Type in an object you want, for the purpose of explaining I will be referring to the object as a teddy bear. You will need to go onto google and type in 'teddy bear' to find a picture of one. After finding the picture of the object/teddy bear you want you need to go through this check list. -Is the background white and black? If so, good. -Is there anything else in the picture? If there is, you need to find another picture or be prepared to have to erase it. -Will you be able to erase loose pixels on the object if needed? If not, you need to find a pose picture to use. There is a high chance you will have a few loose pixels you will need to fix. -Does it have a copy right on the picture? If so do not use it. Step 2: Once you find the picture you want and go through the list to check if you can use it you then save it to your computer. 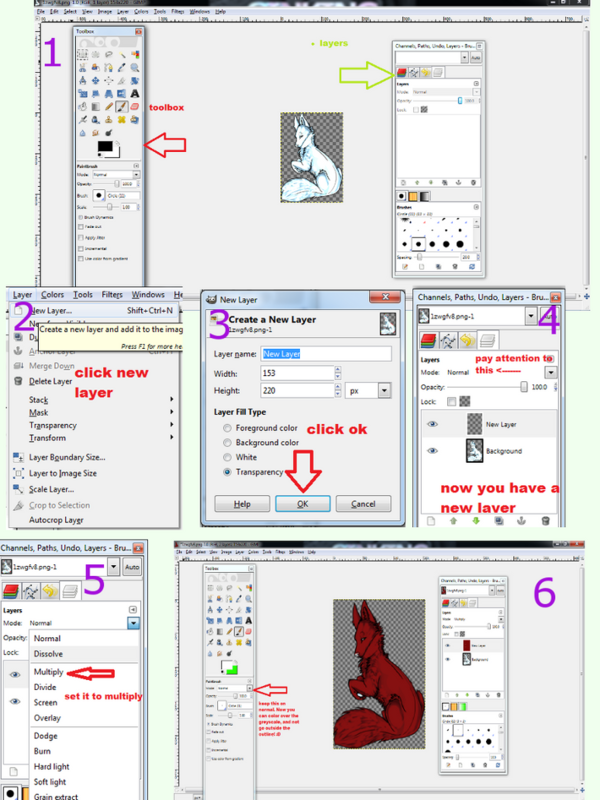 Step 3: Open Gimp and then open the picture/object you wish to use. Step 5: There is a wand looking tool on the box with your tools. Click that and then click on the background NOT on the object you wish to use. After doing so, you press delete on YOUR keyboard. Step 6: Remove loose pixels. 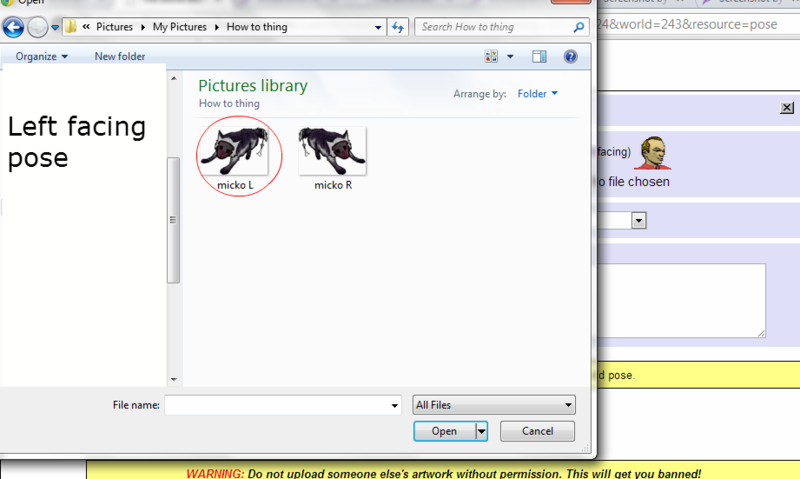 Step 7: Save the picture/object as a .png file to keep the background transparent. Step 8: Now open up your already colored pose (I am not going to go into this since there is already a page on how to color a pose). Step 9: Go to file, then click "open as layer." Once doing that you will select the object/picture you want. Step 10: Use the rotation, re-sizing, and the flipping tools in order to move it where you want, make it the size you want and to place it as you like. 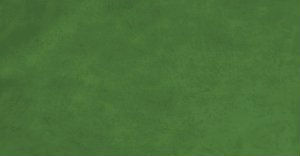 Step 11: After getting the object where you want be sure to check for loose pixels once more just in case. Step 12: Save the pose, close it and then reopen it in order to flip the pose and/or re-size the whole pose if needed. Looking for an easy way to divide your Set Poses from your Custom Uploaded poses? Go to the map and select "Boutique: Custom colors"
Go to the map and select "Custom Rooms, Poses, & Objects"
Once I'm there, how do I upload a pose? This page will show you ALL of your current poses (along with some other things). It will show you what account you are logged into at the top of the page, give you a list of poses currently waiting for review and also show you which poses have been rejected and why. 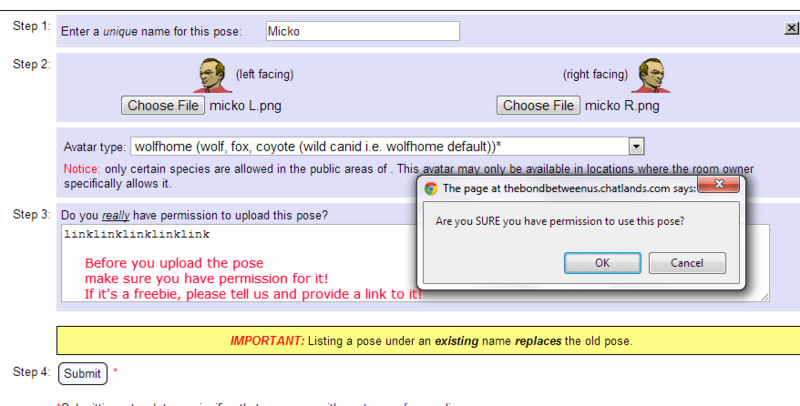 There is an option here to OK poses that other users have transferred to you - however, even after you accept them they must still go by the Art Review Staff in order to appear in your pose list at the top of the page. Once you're in there, click 'Pose Uploader'. 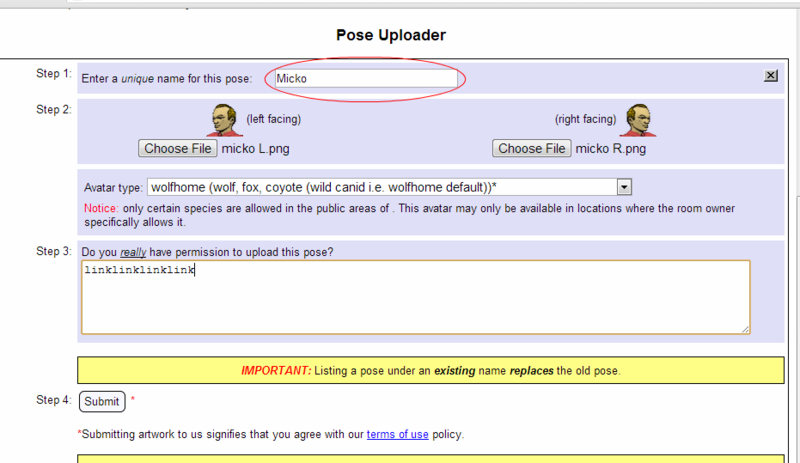 Since you are here to upload a new pose, you will want to scroll down to the form that shows the pose uploader and click "Choose file"
Click the "Choose file" button under the image that has (left facing) written beside it. After you click "Choose file", a box should come up and you will need to change to the directory where you keep your saved poses. Once you have found your poses, select the Left Facing pose. Double click on it, and that filename should appear. A note about locating your pose files... 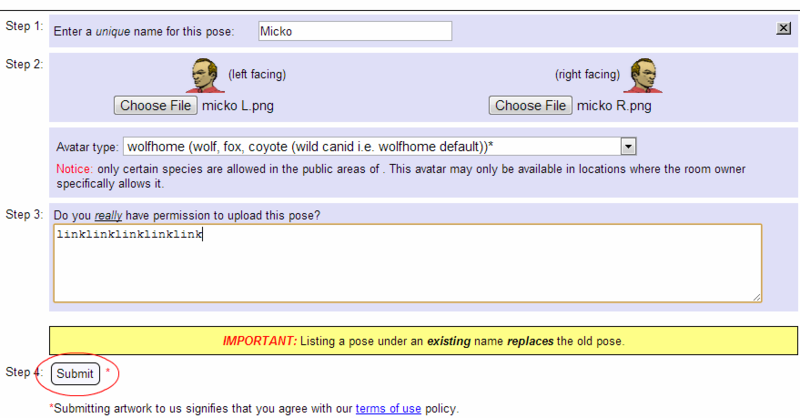 If, for some reason, you click on "Choose file" and when it brings up the box you aren't seeing the pose images you wanted to upload to Wolfhome, chances are that you are in the wrong local directory on your computer. In this case you will need to use the dialog box to change to the right directory. In the screenshot below, you'll notice that it says "My Pictures" at the top, and it is a dropdown menu. That's a likely spot for your poses, but you may choose to keep them someplace else. You will just need to figure out where you put them on your computer and navigate to that folder. After you've finished with your left facing pose, you'll need to do the same thing with the right facing pose. 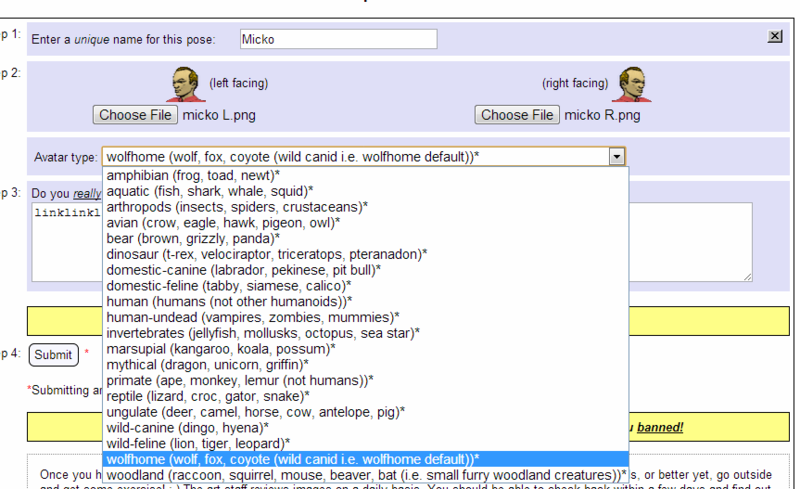 Click the "Choose file" button under the image that has (right facing), find and click the right facing pose, and another filename will appear. Special thanks to WH for this information!